If you install new version of Magento 1.4, you can see that existing differences in structures of eav attributes. 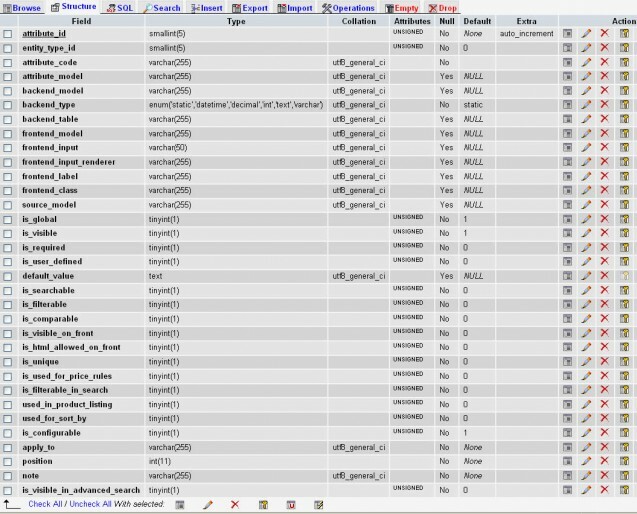 Earlier all data of EAV attributes were in table eav_attribute, now in new version eav_attribute table is smaller, beacuse a lot of fileds moved in new tables. In new version of Magento, we have new table as: catalog_eav_attribute, customer_eav_attribute and so on…..
One important thing: the model Mage_Eav_Model_Entity_Setup has changes in new version of Magento. I have a problems with update attributes. wow.. it’s really a great designer’s view.. I think I really appreciate it. i m overriding customer Controller from front end. i have a problem in adding attribute in database. in customer registration there are only First Name,Lastname,Email ,password and confirm password are there. but i want to add mobile num field also. I am using Magento 1.3.when I update to 1.4 any issues in my cart? Domagoj, I would look forward to hearing what you discovered about changes to EAV in the latest version, I have only just started developing with Magento and did plan to start on 1.4 but couldn’t get it to work at the time so stuck with 1.3 until the new release was more stable. Any insight into the workings of 1.4 are appreciated! Thanks.